Islam is the Problem the Brand Name Doesn’t Matter! If you fell down the stairs and broke your neck, who cares if the number of stairs was 10 or 20? Or, if you came down with malaria, does it matter which mosquito bit you? And if Islamists want you dead, do you wonder which Muslim is going to do the foul deed? No, because all Muslims belong to the same politico-religious army. As jihadist continue to mount increasing numbers of attacks, bombings, shootings, axing and knifings, idiots in the liberal West clamor to make all Muslims jihad-free. But, THERE IS NO DIFFERENCE! Muslims are… Muslims, and all Muslims follow the Koran and hadith. Yes, some to a greater degree than most, but all are of the same stock. This is important to know if we are to stay alive. No, I’m not being over-dramatic or alarmist – ask people in Germany and France! Westerners come out with the same death-knell… they know some very nice Muslims! In the Middle East, Africa and elsewhere, Christians are being systematically slaughtered when ISIS and other Islamic factions enter their districts. These murderers are taken to the houses of Christians and Yazidis by their Muslim neighbors. Some have known each other from birth, have eaten in each other’s homes. Yet, when jihad comes to town, these ‘moderate’ Muslims obey jihadists, and even help with the killing. Why? Because this is the true state of Islamic adherents. The young man who blew himself and others up in Munich was born and raised in Germany – but he was of Iranian Muslim descent. He seems not to have been associated with ISIS. But, his Islamic heart finally obeyed the Koran. Those who knew him had no clue that he was about to turn killer. And that is the huge problem. If we cannot rely on quiet Muslims staying quiet and peaceful, then we cannot trust ANY Muslim. This is a point of logic, not hate speech! And this is why Trump rightfully said all Muslims must be refused entry to the USA until they are heavily checked. It is a matter of self-preservation and fact. Most terrorists are Sunni, but the Munich killer was Shia. This further highlights the fact that it is Islam, not the ‘brand’ that matters. They commit atrocities every single day throughout the world, yet the West defends them and even invites them to stay. Can we invite a tiger to tea and expect it to only eat cakes? Many of the atrocities occur on Fridays, a day favoured by jihadists for murder. As a Coptic Christian said “We Christians know that every Friday is a day of death; that the day after Friday, on Saturday, we’ll be carried to the morgue”. In most instances Christians have lived for many years alongside the ‘moderate’ Muslims in their community. They live together as ‘friends’. Or, do they? Invariably, when ISIS and other jihadists rampage in their neighbourhoods, the ‘moderates’ instantly turn on their one-time friends, sometimes with young boys leading the way with a sword. This is what is happening in ALL Islamic countries. 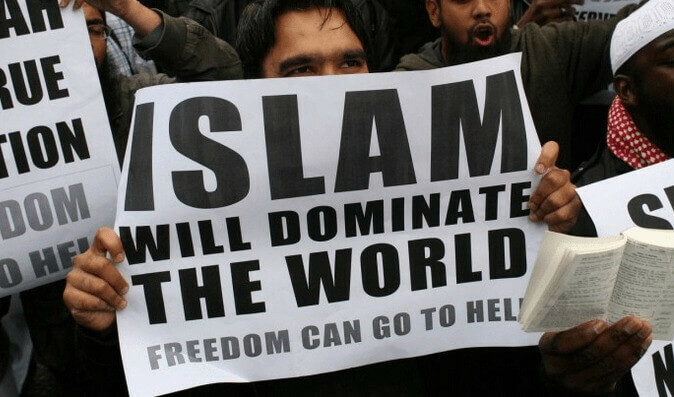 It happens because the Koran says so: “Let believers not take for friends and allies infidels rather than believers: and whoever does this shall have no relationship left with Allah—unless you but guard yourselves against them, taking precautions.” Koran 3:28. The West MUST take heed of taqiyya (lying) and the advice of Muhammad ibn at-Tabara (died 923) who told Muslims: “If you [Muslims] are under their [non-Muslims’] authority, fearing for yourselves, behave loyally to them with your tongue while harboring inner animosity for them … [know that] Allah has forbidden believers from being friendly or on intimate terms with the infidels rather than other believers—except when infidels are above them [in authority]. Should that be the case, let them act friendly towards them while preserving their religion.” (Raymond Ibrahim). It takes a special type of character to harbor hatred while smiling at your ‘friends’, and then to kill them! Do YOU know which Muslim you might know might be harboring this same hatred towards you, and is waiting to show it as soon as his mind is triggered by jihad? I doubt it. He will be your friend… until jihad arrives, or he might even enact it himself as a ‘lone wolf’. Only there is no such thing as a ‘lone wolf’ – he is part of a global Islamic movement bent on taking over the whole world with death and terror. Muslims are warned never to befriend non-Muslims. Again, I ask if you can detect which of your Muslim ‘friends’ is really a friend? Which ‘friend’ is looking forward to slitting your throat? I have to be graphic and blunt, because Obama is turning the USA into a rose-bed for jihadists. European leaders are doing the same, and despite numerous and growing violent incidents, they refuse to name the cause – Islam. I am a Christian and I favor peace and love. But, I don’t want to become a jihadist’ victim! I am a follower of Christ – but I am not stupid! I am VERY wary of ALL Muslims because of the Koran, and because ‘moderates’ everywhere turn against their Christian neighbors instantly jihad arrives. What does that tell us about our Muslim ‘friends’? Only a fool ignores the warning signs. Those in the Middle East and Africa have no choice; they either run carrying nothing with them, or they die. In every way this reminds me of the Jews in Hitler’s Germany, whose ‘friends’ reported their location to the authorities. You might read this and say “But, I’m not a Christian”. Don’t rely on that! To a jihadist if you are not Muslim, or not the right sort of Muslim, you will die. Simple as that. Unless Americans scream for truth and protection, Obama will bring those jihadists to the USA, and they WILL kill in numbers, just as they are killing in Europe, where they are even given excuses. Islamic expansionism must be stopped NOW, no matter how loudly Muslims howl. Forget accusations of ‘Islamophobia’ – your very life may be at stake. Kaine: an Anti-Abortion Supporter of Abortion!Assimilation: The Antidote to Extremism?